Peru’s Foreign Affairs Minister Nestor Popolizio delivers a speech during the closing of the meeting of the "Lima Group," which includes Canada and most of Latin America's top powers, to assess the current situation in Venezuela, in Lima on Jan. 4, 2019. 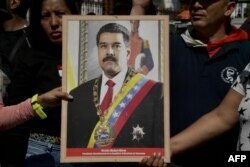 Supporters of Venezuelan President Nicolas Maduro hold a portrait of him in a ceremony to swear him in symbolically in front of the National Assembly building during a rally around the city in Caracas, Venezuela on Jan. 7, 2019. However, Mexico — under the new leftist government of President Andres Manuel Lopez Obrador — refused to sign the statement.